2017 was a special year for Canada. People of all ages and backgrounds gathered from across the country to celebrate this important milestone in Canadian history. This anniversary also presented a great opportunity for coin collectors, with some very impressive coins being minted for the occasion. 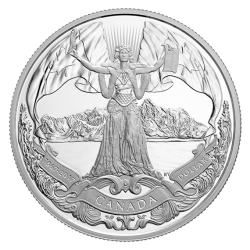 The Royal Canadian Mint embraced the 150th Anniversary and minted a wide variety of coins, each with their own eye-catching designs and their unique artwork depicting the Canadian story. A truly unique coin for any collection is the 2017 Proudly Canadian coin. This $5 coin glows in the dark and is made from 99.99% silver. 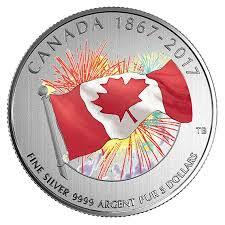 The coin showcases a stunning red and white Canadian flag packaged in a folder with celebratory fireworks, the same fireworks that were set off in Canadian cities across the country. Once the coin is exposed to light it will actually glow in the dark, a unique feature rarely found in coins. The coin marks the anniversary by proudly displaying the dates of 1867-2017. This coin is part of the Royal Canadian Mint’s three coin subscription set used the celebrate the 150th anniversary. Other coins in the subscription include the Spirit of Canada coin and the Heart of Our Nation coin. Like the Proudly Canadian coin, each piece in the set is made from 99.99% pure silver and utilizes its artwork to tell the story of Canada and its people. The set includes a unique folder-style packaging that allows you to proudly showcase your coins. 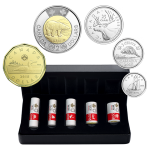 The 2017 Classic Canadian Coin Special Wrap Roll collection is another unique piece offered by the Royal Canadian Mint. This collection features a wide range of coins that proudly display classic Canadian emblems found on our nation’s currency over the years. This rolled set was specially minted for the 150th-anniversary celebrations. The roll includes 2 dollar coins, 1 dollar coins, 25 cent coins, dimes, and nickels. A finely crafted case holds the coin collection together. Within the collection, you will find popular Canadian symbols such as the polar bear, common loon, Bluenose, beaver and caribou. This is a rare opportunity to collect a wide range of coins that will not be added to circulation. Another unique coin offered in 2017 was the 2017 Proof Pure Silver Dollar. This is a stunning coin with a very modern and Canadian twist. Designed by Canadian artist Rebecca Yanovskaya, the coin is made of 99.99% pure silver and is a must-have for any Canadian coin collection.